Not another bloody Royal Wedding blog post? However, if you think I’m going to post some ant-royalist diatribe, you also have me wrong. I’m not going to knock the Royals, I’m as loyal and patriotic as the next man (or woman) indeed, I’ve even sworn my allegiance to HM Queen Elizabeth II on two separate occasions. Having said that and for some time now, I’ve actually felt like I was part of an ever decreasing number who support our Royal Family, until today perhaps? The Royal Wedding displayed sufficient Pomp and Circumstance to keep even Elgar bouncing around in his grave. As usual, non of it would have been possible without the skills and professionalism of our military, the Metropolitan Police and all the other Emergency services. Who knows, perhaps it even did something to swell a little pride in the chest of our more apathetic and anarchistic British subjects, although I doubt it. There will still be many who hold the republican view but why is that? In my opinion, I would suggest there are probably two main reasons. Issues that underpin the remainder of the perceived or politically contrived ones. The first is the methodology of our mass media, which often has an opposite effect to the one intended. Since the original announcement of Kate & Wills engagement back in November 2010, our newspapers and TV have gone into operation overkill, jam-packed with excessive levels of hyped up drivel. They will continue for several weeks after the event, dissecting and commenting upon every miniscule detail, to the extent people get sick to death of hearing about the bloody wedding. I have to say, despite being a loyal supporter of the Royal Family, I was fed up to the back teeth long before the happy day. The second, but all too common factor, is the human trait of jealousy. It is always far easier to try to shift blame towards those more fortunate than you, than it is to accept and/or adjust your personal predicament. Isn’t it strange how the Monarchy is often more popular, and held in far higher regard in other countries like the USA, than it actually is at home? 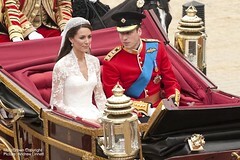 As many of the commentators pointed out during the wedding, Royalty and ceremony is so quintessentially British, it is a trademark or unique selling point. It is also something we should actually be proud of, not embarrassed about. But here’s the rub; for many years now we have been conditioned into believing pride is actually a sin and that we should be embarrassed and/or guilty about traditions and history. We are expected to bow down subservient to all who seek to challenge us, be they right or wrong. Combine all these factors, which in many ways tend to feed on each other, and you have a recipe for a republican revolution. Kate & William are the future face of our Monarchy and I salute them. I also wish them good health and wedded bliss throughout their future years together. As they appear to be exceedingly popular with the British (and world) public, I think it’s highly likely that some of our buried and hidden pride may once again return to the fore. I suggest all the wanna be Citizen Smiffy types pack away their Fasces and sickles, or go back to using it for gardening… At least for now!